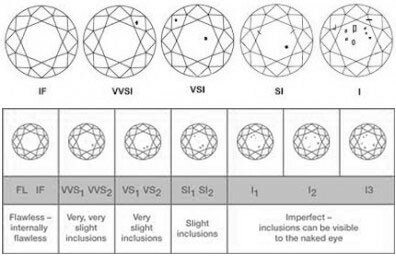 1) The diamond quality can be communicated in a universal language. 2) Diamond buying consumers can know exactly what they are about to purchase. We will explain the 4C’s to you in detail at your appointment. The cut of your diamond, in other words, how it is made, determines the level of sparkle, brilliance and fire visible in your gem. The cut scale ranges from excellent, very good, good, fair, poor. To reflect and refract light most effectively, diamonds must be cut to the correct proportions so that each facet is precisely placed, and polished to a recognised, international standard. 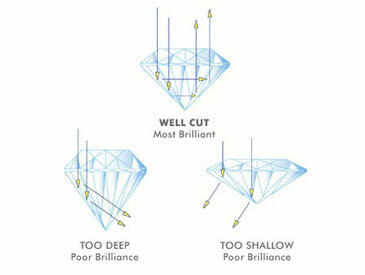 Diamonds that are not cut and polished to these high standards do not handle light correctly, diminishing both their beauty and value. 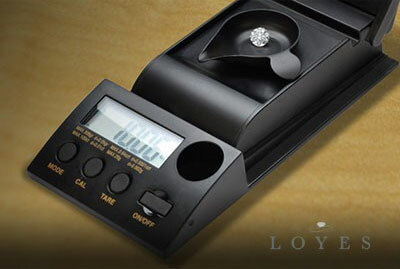 At Loyes Diamonds we strive for maximum brilliance and beauty in every diamond. We insist on excellent quality of cut to ensure that our diamonds truly sparkle. Diamond quality and value is also determined by subtle colour differences, sometimes barely discernible to the untrained eye. The colour scale extends from D (colourless) to Z (yellow/brown). The best and the rarest diamonds appear colourless (white) or near colourless and are graded D to I, with D and E being extremely rare. From I onwards, the colour quality diminishes and yellow/brown tones become more evident. The colour grade of diamonds is determined by comparing each individual diamond to a master set that is calibrated to a worldwide standard. The clarity rating of a diamond is a key measure of its overall quality. Almost every gemstone is marked with nature’s fingerprints; these are called “inclusions”. The clarity grading of a diamond measures the position, volume and colour of its inclusions, which can be black or white in colour. The beauty and value of a diamond is affected by obvious inclusions, as they affect the passage of light through the stone. Most diamonds have inclusions; some are so microscopic that they can only be seen under 50 X magnification, others can be seen by the naked eye. Some diamonds have no inclusions and these are extremely rare. These diamonds are referred to as “Internally Flawless”. At Loyes, we select only diamonds that have no inclusions, or diamonds whose inclusions are so minute as to be barely discernible and which, even under magnification, are not visible to the naked eye. The term carat is the unit of weight for diamonds. A carat is equivalent to 0.2 grams. Carat is the most price-sensitive element of a diamond as it refers to the mass and proportionate size. Diamonds are rare, and as the size and carat weight of diamonds sold increases, they become even more scarce. At Loyes, we supply diamonds in all carat weights, thereby enabling you to acquire the best quality and size for your taste and budget.